The San Diego Green Business Network helps San Diego businesses cut operating costs, share impactful ideas with peers and get free marketing support to improve sustainability. Improving energy and water efficiency, reducing waste and improving air quality boosts the bottom line for your business. It’s great for the environment, too! Get started right now for free. 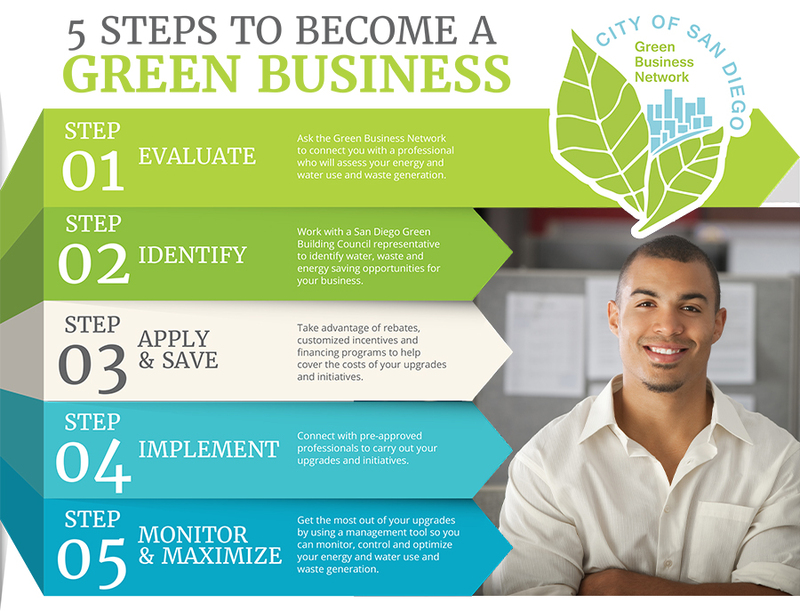 The San Diego Green Business Network is a FREE and easy-to-join program that San Diego businesses can leverage to save energy, money and resources. Improving energy and water efficiency, reducing waste, and improving air quality improves the bottom line for your business. It’s great for the environment, too! Become a Green Business Network member and take advantage of our resources! Evaluate: Ask the Green Business Network to connect you with a professional who will assess your energy and water use and waste generation. Identify: Work with an energy assessor to identify water-, waste- and energy-saving opportunities for your business. Apply & Save: Take advantage of rebates, customized incentives and financing programs to help cover the costs of your upgrades and initiatives. Implement: Connect with pre-approved professionals to carry out your upgrades and initiatives. Monitor & Maximize: Get the most out of your upgrades by using a management tool so you can monitor, control and optimize your energy and water use and waste generation.